Attenuated total reflectance-Fourier transform infrared (ATR-FTIR) spectroscopy with a diamond ATR crystal was used to examine 41 historical polymer fragments and a selection of polyurethane fragments subjected to accelerated ageing. The advantages and limitations of FTIR data for polymer assessment is discussed. Moreover the efficacy of the data interpretation tool principal component analysis (PCA) is debated for potential applications in polymer characterisation and polymer degradation. Analysis of polymer fragments by ATR-FTIR spectra was shown, as expected, to be an ideal method for polymer classification. Curved surfaces could be tolerated when spectral data were carefully collected, similarly opaque samples could be analysed due to the reflective nature of the FTIR technique used. More importantly perhaps, these results reaffirm the necessity to examine individual spectra as further information can be obtained which allow a better understanding of the material’s stability. It was possible to identify potential degradation of cellulose nitrate and rubber, discriminate between the ether and ester-form of polyurethane, and discriminate between high and low density polyethylene. It was also shown that PCA could be used to unambiguously identify samples which contained cellulose acetate, cellulose nitrate, polycarbonate or polyurethane with a selection of known samples, but without the use of a spectral library. This study supports previous publication results indicating that ATR-FTIR is a useful tool for the examination of objects containing polymers. Here it was shown that polymers could be characterised in object fragments that were not specially prepared and without the use of a spectral library. PCA was shown to be a useful tool for the unambiguous identification of cellulose acetate, cellulose nitrate, polycarbonate or polyurethane polymers in historical plastics with different additives, plasticisers or age. More excitingly, even though spectral features were similar for new and aged samples of polyurethane, PCA was able to discriminate between samples of foam that had been treated by heat (50°C for 24 h or 144 h) or by exposure to light, although more results for other polymeric materials are required to support this proof of concept study. Objects that contain synthetic, complex and inherently unstable modern materials, particularly polymer-based materials, are becoming integral parts of heritage collections at ever increasing rates; reflecting both the growing use of these materials in modern society and an interest in their own artistic qualities and interpretation. Many synthetic polymers were sought after as they were made to imitate more expensive materials such as tortoiseshell [1, 2] and ivory [1, 3]. Now polymers feature in museum collections in a wide variety of forms from packing materials and storage containers to sculpture, jewellery, toys and cinematic film. There are also many examples of natural plastic materials within heritage collections such as shellac, gutta percha and horn. Such materials were moulded and used for a variety of applications including buttons, brooches and liquid receptacles . Unsurprisingly polymeric materials are present in almost all heritage collections across the world and represent a tribute to industrial, social or cultural progress. As relatively recent additions to heritage collections these contemporary materials are less well studied and their chemical decomposition pathways have not yet been fully elucidated. Moreover, it is often difficult to determine the nature of the polymer used within an object making it difficult to determine appropriate storage conditions or assess an object’s potential to degrade under the imposed environmental storage or display conditions. Deterioration of many thousands of polymer, or polymer-containing objects, is now becoming apparent and research questions regarding the durability of contemporary art objects need to be addressed. The concept of degradation and useful lifetime can often be indistinct. The polymer industry regard a polymer as being degraded when it loses a particular percentage of the object’s original weight, at which stage the plastic is considered to have reached the end of its useful lifetime. In a heritage context the definition is not as well defined and objects often have to be considered on a case by case basis. With regards to heritage objects the term ‘useful lifetime’ can often be misunderstood. Objects are not necessarily ‘in-use’ in a traditional sense, but rather are on display or in storage. In general, most heritage institutions would regard an object as being at the end of its useful lifetime when it shows significant loss of quality or when the original meaning of the object is no longer perceivable. In addition, an object may be considered at the end of its lifetime when its degradation is causing an adverse impact on other collection items, at which point it will be removed from exhibition. Previous museum surveys in the 1990′s [5, 6], provided a snapshot of polymer object condition at the time of monitoring. In a survey based at the British Museum, the number of polymer objects was so large (> 3000 objects) that only a representative part of the collection was examined and visual signs of degradation and requirement for conservation work were noted together with the surrounding environmental conditions . The types of polymers identified in the collection included cellulose acetate, Bakelite (phenol formaldehyde), cellulose nitrate, polyurethane, polypropylene, polyethylene, nylon, polystyrene, rubber and poly (vinyl chloride) (PVC). The results of the study highlighted that 27.5% of the collection required no treatment, 60% was deemed a low conservation priority and 12% required essential work. In addition, approximately 0.6% of the objects surveyed were in need of immediate conservation treatment; all of these contained PVC and were actively degrading and producing surface tackiness as a result of plasticiser migration. More recently, a survey was conducted in the furniture collection at the Victoria and Albert Museum as part of the Popart project . The objects ranged in date from the 1930’s to modern day and included historic plastics to modern recycled materials. Of the 200 objects surveyed 57% were found to be in good condition, 28% were recorded to be in a fair state (interpreted as having minor damage such as discolouration), 12% were in a poor condition (physical damage was present with brittleness and sweating of objects being a possibility). Only 3% of the objects studied were classed as unacceptable and therefore chemically unstable; this time the most unstable objects contained polyurethane. Deterioration of polymeric objects can manifest itself in many ways. Materials can change colour, become physically deformed and fragile or may break apart into hundreds of smaller pieces. An additional problem that should not be underestimated is that during the deterioration process volatile organic compounds (VOCs) are often emitted from the surface of the object as it degrades. These VOCs, if acidic, can further exacerbate the object’s chemical decay pathway (e.g. inducing an auto-catalytic degradation cycle) or it could induce the corrosion of metal or calcareous objects held in close proximity to the degrading polymer . Cellulose acetate, cellulose nitrate and PVC are materials which are known to emit acetic acid, nitric acid or hydrochloric acids, respectively, during degradation [9–12]. For example, conservators at the British Museum were alerted to nitric acid emission from a cellulose nitrate shadow puppet when the tissue paper used to pack the puppet became increasingly yellow and brittle to the touch . In addition, the metal rivets which held the puppet together were corroded and the legs of the puppet had become severely crazed. Tests identified the plastic as cellulose nitrate and found a pH gradient across the object with the legs being highly acidic (pH 3.2 ± 0.2) and the body less so (pH 5 ± 0.2). In this research study, 41 unknown polymer fragments were collected from standard reference materials (ResinKit™, Woonsocket, USA), industrial standards (supplied by the Scottish Plastic and Rubber Association, SPRA) and objects from private collections (see Table 1). The ability of ATR-FTIR spectroscopy to identify and classify polymers from such a wide range of sources, (with differing formulations, additives and plasticisers) was assessed. Samples were not modified prior to analysis and ranged in size from 1.3 cm2 to 10.6 cm2, each having an approximate mass of 100 mg. Classification was attempted based on a visual assessment of spectroscopic data after which the data was analysed by PCA. Knowing that the age of plastic materials ranges dramatically in heritage collections, 5 polyurethane fragments were also subjected to accelerated ageing and the collected spectral data were reassessed visually and using PCA to assess the utility of the spectroscopic method for the analysis of polymers in historical collections. The 41 sample fragments analysed in this study were of varying formulations, age, texture, topography, colour and shape. Nonetheless, identification of polymer type was possible without the need for sample preparation, such as solvent extraction. The use of a pressure clamp for solids was necessary to provide good contact between the sample and the diamond window used in the ATR-FTIR instrument. However, the force used to provide good contact with the crystal and the surface of the object created visual indentations on the more pliable materials such as PVC, polyethylene, polyurethane foams and rubber. It is possible to use spacers, which lessen the indentations on a measured sample by spreading the pressure over a larger area, however the use of spacers can make the analysis more cumbersome. Indentations were more pronounced on samples which were already in a degraded and vulnerable state. It is therefore suggested that analysis by ATR-FTIR using a pressure clamp for solids could be used on ‘hard’ polymer samples or, if possible, using fragments which have already fallen, or broken, from catalogued heritage objects. Otherwise small indentations will need to be tolerated during analysis and the sample area needs to be carefully selected. Difficulties were also experienced during the analysis of samples which had an unusual shape, for example, the analysis of a rounded dolls milk bottle was challenging. This polycarbonate sample had threading indentations for a screw cap and the unusual shape meant that it took some time to locate an area that gave good contact with the FTIR-ATR crystal. However it was still possible to collect spectroscopic data without further sample preparation such as using a microtome to provide a smooth surface. The ATR-FTIR spectra were collected in replicate (n = 10) across the surface of the 41 polymer fragments. Collected spectroscopic data were examined to identify the main IR absorption bands and to classify the unknown polymer fragments; the results are given in Table 2 and compared with previously published results [14–26]. Not all users of ATR-FTIR possess a polymer sample library therefore representative spectra for each polymer type can be viewed within the additional information section in the online version of this paper (see Additional file 1, Additional file 2, Additional file 3, Additional file 4, Additional file 5, Additional file 6, Additional file 7, Additional file 8, Additional file 9). In addition, examination of individual spectra can provide the user with further interpretation that is not otherwise possible if, for example, spectral database matching was used rather than spectra interpretation. Examples are given below. In the case of cellulose nitrate each sample analysed featured a peak at 1721 cm-1 that was attributed to a carbonyl stretch. The presence of a carbonyl containing plasticiser, such as camphor or phthalate ester, was ruled out as it was not possible to identify the other characteristic bands for camphor (2963 and 2874 cm-1) , or phthalate plasticiser (2861, 1579 and 1602 cm-1) [28, 29]. It was therefore proposed that the carbonyl stretch indicated sample degradation and the intensity of this peak could potentially be used to indicate the state of degradation . The spectra of polycarbonate samples had aromatic stretches at 1594, 1605, 1081, 1015 and 830 cm-1 suggesting an aromatic, rather than aliphatic, base structure, most likely bisphenol A. The spectra from rubber samples had additional peaks at 3350 and 1714 cm-1, which were attributed to an OH and carbonyl stretch. Nor and Ebdon  reported these peaks to be present in natural rubber samples which had been degraded by ozonolysis. It is therefore proposed that these peaks could again be used to provide an inferential measure of the state of degradation of rubber samples. The spectra of polyurethane samples HS 86, 458, 461 and 464 indicated these samples were produced using an ether polyol. This was confirmed by the absence of bands at 1187, 1128 and 1064 cm-1 which are attributed to the C-O-C bend of the ester polyol . Moreover, sample HS 69 could be identified as a polyurethane elastomer with additional bands present at 2936, 1702shoulder, 1188, 1162, 1103, 1065, 1047 and 730 cm-1. The bands at 1188 and 1065 cm-1 were attributed to the C-O-C bend of an ester polyol. Bands present at 1166 and 996 cm-1 in polypropylene spectra were indicative of the isotactic form of this material [31, 32]. Furthermore, sample HS 416 had an absorption band at 1740 cm-1 which was attributed to a carbonyl stretch present due to oxidative degradation of the sample. Polyethylene sample HS80 had an additional band present at 1378 cm-1, which was attributed to a CH3 bend and is indicative of low density polyethylene; which has a small amount of branching on the polymer chains. The band at 1378 cm-1 was not present in the other polyethylene samples (see Table 2) suggesting no branching in the polymer chains, indicating high density polyethylene. Although the polymers present in all samples were successfully characterised here by visual examination of collected spectra, users can often rely on the use of spectral libraries for matching the spectra of unknown materials with stored data. It is common for commercial libraries to use spectra from new (pristine) samples. However, as a plastic sample ages the search algorithms may become less effective and matches will become poorer to the point where an incorrect match could be generated. In-house built libraries which contain a range of degraded sample spectra could overcome this potential problem, however not all users have such a facility. Therefore, spectral data was interrogated using principal component analysis to assess whether it could be used to unambiguously identify a polymer type in a sample regardless of its age, formulation or the presence of additives and plasticisers. The collected spectra (n = 10) of the 41 samples were exported into MatLab, derivatised, normalised and mean centred before principal component analysis (PCA) was used to assess sample correlations. From the PCA results, the eigenvalue plot indicated that 10 principal components (PCs) could be used to describe 92% of the data variation, however the first 4 PCs showed specific sample types which tended to be distinct from the other samples. 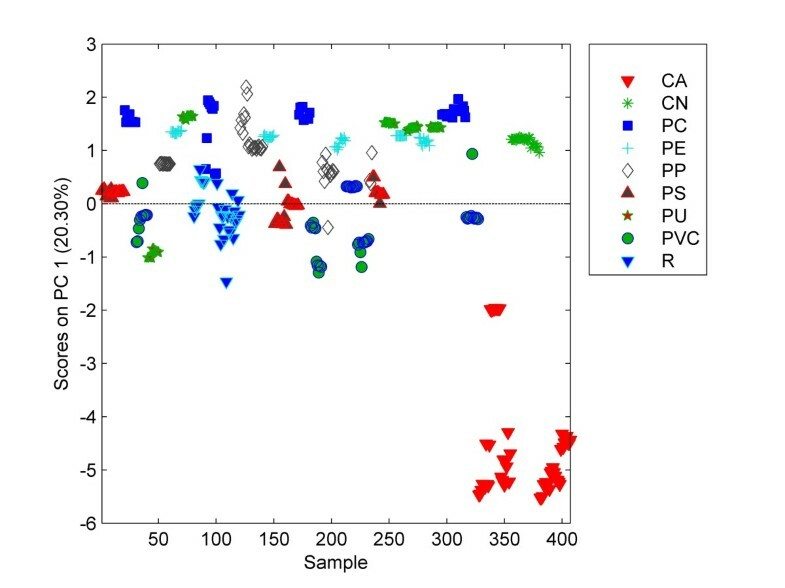 Examination of the scores plot for PC 1 (see Figure 1) indicated that most of the samples have scores values between −1.5 and 2, with samples of the same type having similar scores, e.g. all the polycarbonate samples have a PC1 score value of 1.5 to 1.75. 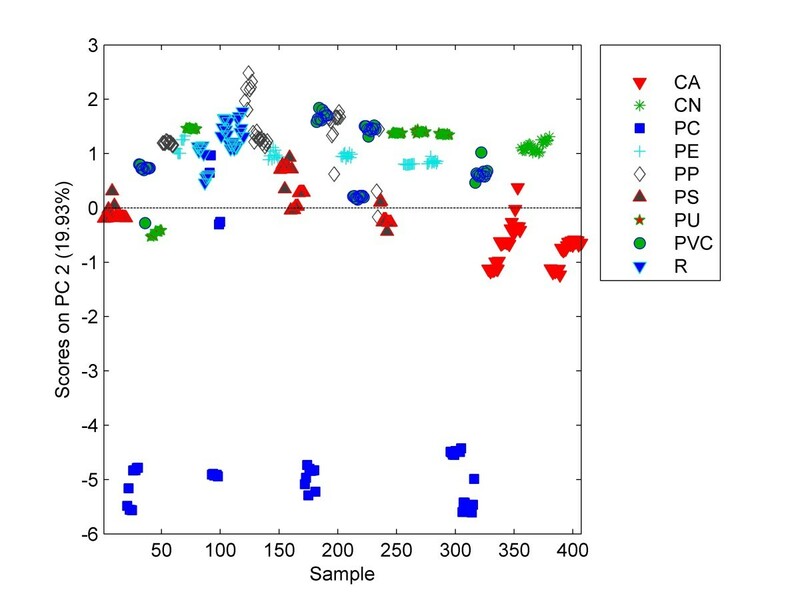 However, the PC1 scores values observed for cellulose acetate (−5.5 to −2) are clearly distinct (see triangles at the bottom right hand side of Figure 1) from those observed for the other 8 different polymer types, suggesting that PC1 can be used to discriminate cellulose acetate. 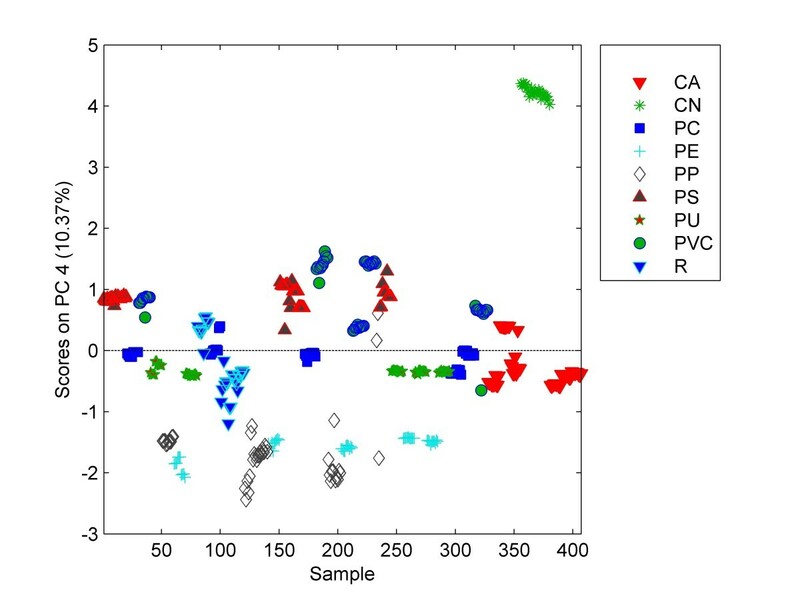 The scores plots for PC2, PC3 and PC4 (see Figures 2, 3 and 4), demonstrated distinct scores values for polycarbonate samples (PC2 scores values between −4.2 and −5.6), polyurethane samples (PC3 scores values between −4.0 and −4.8) and cellulose nitrate samples (PC4 scores values between 4.0 and 4.5), respectively. Interestingly, the polyurethane elastomer (HS69-highlighted in Figure 3 with a red circle) did not fit into the grouping of polyurethane foams; this level of discrimination was not possible by examination of the original spectra. A range of scores values are observed for the 10 repeat measurements of individual samples owing to slight variations in the sample surface. An uneven sample surface can create poorer contact between the sample and the crystal window of the ATR-FTIR, which will lead to slight differences in the spectra. However, the variation was minor and did not affect the ability to unambiguously identify samples which contained cellulose acetate, polycarbonate, polyurethane and cellulose nitrate on the basis of their PC1, PC2, PC3 and PC4 scores, respectively. Where samples had a smooth and regular surface good surface contact resulted in less cluster variation (for example see Figure 4). Here it was necessary to have samples of known type to undertake the PCA analyses, however it is proposed that sample classification of unknowns would be possible with the use of clustering and discrimination tools. A polyurethane foam sample was cut (n = 5) and used as a case study to assess the use of ATR-FTIR to discriminate between ‘fresh’ and ‘aged’ polyurethane samples. The 5 sections of foam were placed in a Weather-Ometer and subjected to the conditions given in Table 3. After ageing the measured original replicate spectra for all 5 samples (PU1 – PU5) were examined visually and although some spectral differences were observed it was not possible to clearly distinguish between the replicate spectra (n = 10) collected for the unaged sample (PU1) or samples aged for 24 h in the dark (PU2), 24 h in the light (PU3), 144 h in the dark (PU4) or 144 h in the light (PU5) despite the fact that PU5, in particular, showed significant signs of degradation, such as discolouration and crumbling. All of the other samples PU2-4 looked unchanged from the unaged sample (PU1). When the replicate spectra were imported into Matlab, derivatised, normalised and mean-centred PCA was able to clearly differentiate the samples, as illustrated in Figure 5. This would suggest that it is possible to identify the early onset of degradation of polyurethane foam using PCA; this would not be possible by spectral matching using commercial or online databases. The unaged PU1 sample spectra were clustered together with a high PC1 score and zero PC2 score (see triangles at far RHS of the figure). Moving down along the PC1 axis, the next set of data that clustered together belonged to PU2 (stars), this sample was exposed in the chamber for 24 h but protected from light. Moving further down along the PC1 axis, PU3 data (squares) clustered together indicating that light does have an impact on the sample even after a 24 h exposure. Samples placed in the Weather-Ometer for 144 h were easily distinguished from those aged for 24 h: Samples PU4 (diamonds) and PU5 (crosses) had negative PC1 scores whereas samples PU2 and PU3 had positive PC1 scores. Examination of the PC1 score values will permit differentiation between samples which have been thermally aged at 50% RH for either 24 or 144 h, indicating that a chemical difference had been imparted to samples with increased exposure time. Light ageing did not appear to affect the PU sample when an ageing time of 24 h was applied (no difference in PC2 score for PU2 or PU3). In contrast after the 144 h ageing time, spectra from the sample which was protected from light (PU4) clustered together in the lower left hand quadrant of the scores plot (negative PC2 scores) whereas the sample which was subjected to light (PU5) clustered together in the upper left hand quadrant of the scores plot. Using this model it would therefore be possible to determine whether unknown PU samples were ‘fresh’, thermally aged or photochemically aged by projecting its PCA result onto the PC1 versus PC2 scores plot. PC1 versus PC2 scores plot for unaged and aged polyurethane sample HS464. A transportable diamond crystal attenuated total reflectance-Fourier transform infrared (ATR-FTIR) spectrometer (Agilent Technologies 5500a) was used to collect spectra in the 650–4000 cm-1 region. The spectra were collected using Microlab PC software in absorbance mode using 128 scans at 8 cm-1 resolution. No sample preparation was required and polymers were directly analysed on the diamond window. Intimate contact of the sample with the crystal window was required to give good quality spectra; samples were clamped against the diamond window using a pressure clamp for solids. Samples were often irregularly shaped and ten spectra (n = 10) were recorded across the entire surface of the object under study. Spectra were processed with MATLAB version 7.13.0.564 (R2011b) (Mathworks Inc., Natick, MA, USA) incorporating PLS_Toolbox version 6.7 (Eigenvector Research Inc., WA, USA). Data were derivatised (Savitzky Golay 1st derivative filter with 13 points and a 2nd order polynomial) to remove baseline offset, normalised to the largest peak and then mean centred prior to carrying out PCA. The pre-processing techniques used helped to reduce noise and emphasise any regions of spectral change. A method of determining correlations in spectral data sets is to use PCA which describes the data, not by wavenumber, but using a smaller number of ‘latent’ variables, called principal components (PCs). The PC’s, obtained from the original data must reflect the underlying structure of the data, both in terms of the relationships between the different samples (objects) and the relationship between the different measurement variables (e.g. spectral wavenumber). Comparison of the samples’ principal components will permit easy detection of correlations between samples and/or their original variables. When analysing PCA data, the eigenplot is first examined to determine the number of PCs that reflect the variation in the data. Those PCs are then further interrogated using, in this instance, scores plots to examine sample correlations. 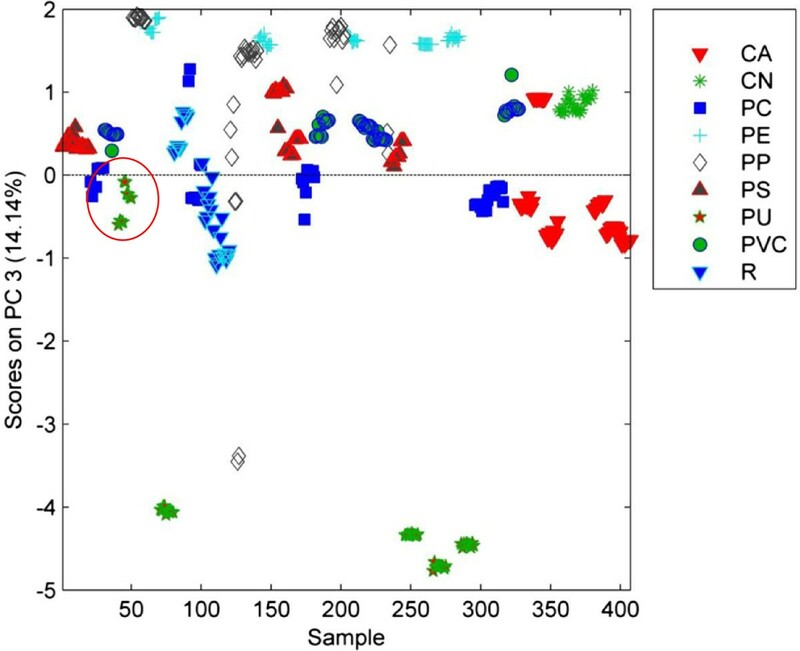 Samples with similar spectral features should cluster together in the scores plot where the PCs contain information on these spectral features. Accelerated ageing was conducted on polyurethane sample HS464. Artificial ageing was conducted using an Atlas Ci4000 Weather-Ometer and the conditions used are given in Table 3. The xenon light source used had full spectrum from 200 nm to 750 nm with a CIRA inner, and a soda lime and float glass outer filter to provide a cut-off at 300 nm. The irradiance measured at a wavelength of 420 nm was 1 Wm-2 (approximately 0.4 Wm-2 at 340 nm); samples PU2 and PU4 were protected from the light using an additional UV filter. The polyurethane fragments were attached to acid free conservation grade cardboard, mounted in brackets and hung inside the Weather-Ometer. After ageing, the samples were analysed using the same ATR-FTIR instrument and conditions outlined above and the spectra were compared to reference spectra collected from an unaged fragment of HS464. ATR-FTIR spectroscopy was, once again, shown to be a suitable method of characterisation of unknown polymers commonly found in heritage collections. Here the spectra were interpreted by band assignment rather than using spectral matching via libraries. Polymer fragments were analysed without sample pre-treatment and were easily identified by visual examination of the collected spectra. The technique lends itself to the analysis of smaller polymer samples (due to the use of the pressure clamp) or polymer fragments. Care needs to be taken when ‘softer’ samples are analysed to ensure the imprint from the arm clamp is not visually apparent after sampling. It should also be noted that ATR-FTIR spectroscopy is a surface technique therefore caution must be used when analysing a sample which could comprise of polymer layers. Matching unknown samples to collected data was attempted using PCA rather than spectral libraries. It was possible to unambiguously determine samples that contained cellulose acetate, polycarbonate, polyurethane foam or cellulose nitrate; regardless of the age of the sample, its formulation or the presence of additives. More importantly, PCA was used to differentiate polyurethane samples that had been aged using thermal- or photo-ageing treatment despite the inability to see visual changes in either the material or the collected spectra. This provides users with a tool to identify the early stages of polyurethane deterioration. Similar work is now being conducted on the other polymer family groups identified in this study. The Science and Heritage Programme of the AHRC/EPSRC is gratefully acknowledged for the funding which supported this study. The Kluge Center and the Library of Congress are gratefully acknowledged for facilitating accelerated ageing and providing access to collections. Agilent Technologies is gratefully acknowledged for allowing access to their instrumentation. The British Museum, University College London and Edinburgh Napier University are acknowledged for the supply of some of the samples used in this study. The Royal Society is thanked for the award of a University Research Fellowship to AN. GM: Analysis and ageing of plastic samples, data interpretation and write article. LTG: design of experiments, data interpretation and article review. FF: design of experiments and article review. AN: Principal component analysis and article review. PTL: ATR-FTIR instrumentation and article review. All authors have read and approved the final manuscript.